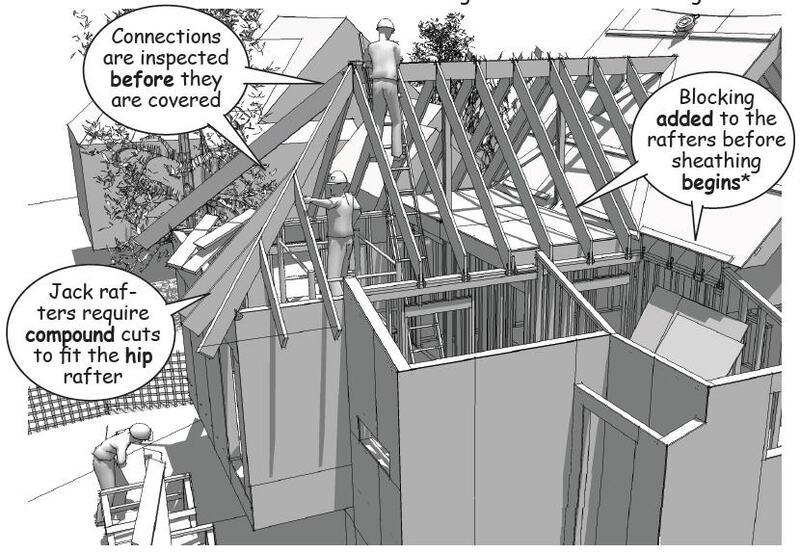 The framing for the hip roof requires compound cuts along the ridge lines at the intersections of the sloping hip roofs. The angles for these cuts are derived from the plane or slope at these intersections. 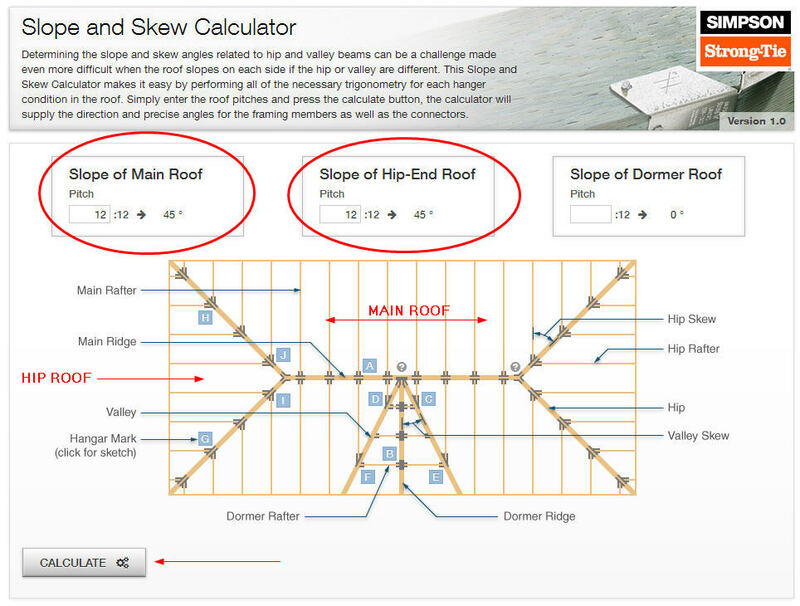 The pitch of the hip’s ridge beams was once determined using a “rule of thumb” and some intuitive guessing on the part of a lead carpenter, but Simpson StrongTie has since set up an online calculator that makes the field-work much easier. The calculator can be found here. 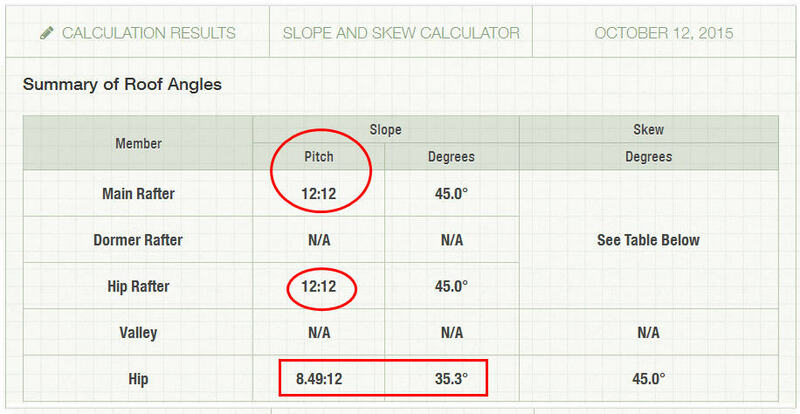 Start the calculation by inputting the slope of the Main Roof and the Hip Roof. The pitch of the main roof is the same as the longer north-south slope that has already been erected. The hip roof is the triangular portion of the roof that remains to be constructed. After you press “CALCULATE,” The results are shown on a table. For this roof the 12:12 pitch of the main and hip roofs result in a 35.3 degree pitch for the ridge beams on each side of the hip roof. The geometry of the roof means that these hip beams slope from the end of the cantilevered ridge to each corner of the wall framing. In this example, the angle is about 35 degrees. Structural connectors are used to secure the ends of the hip ridge beams at the cantilevered ridge and the wall corners. These connectors are important because they counter the lateral and uplift loads imposed on the roof by strong wind or seismic activity. Once the ridge beams are in place, “jack rafters” are cut at a compound angle so they fit to the side of the hip beam. A jack rafter is a short rafter used to complete the framing for the roof at a hip or valley. Cutting the compound angle requires an experienced carpenter because the cut must match the pitch of the main and hip roofs as well as the angle of the ridge along the intersecting planes. 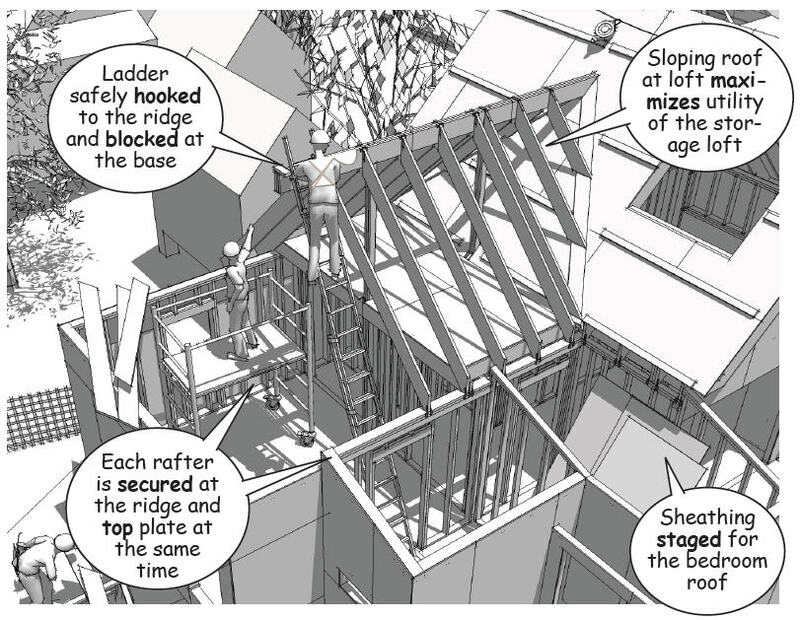 Skilled carpenters start with the lower jack rafters, testing their cuts and creating a template that they then use as a guide to complete the framing. Once the rafters are in place, the overhangs are trimmed to receive the structural fascia and the roof sheathing is added to stiffen the framing. 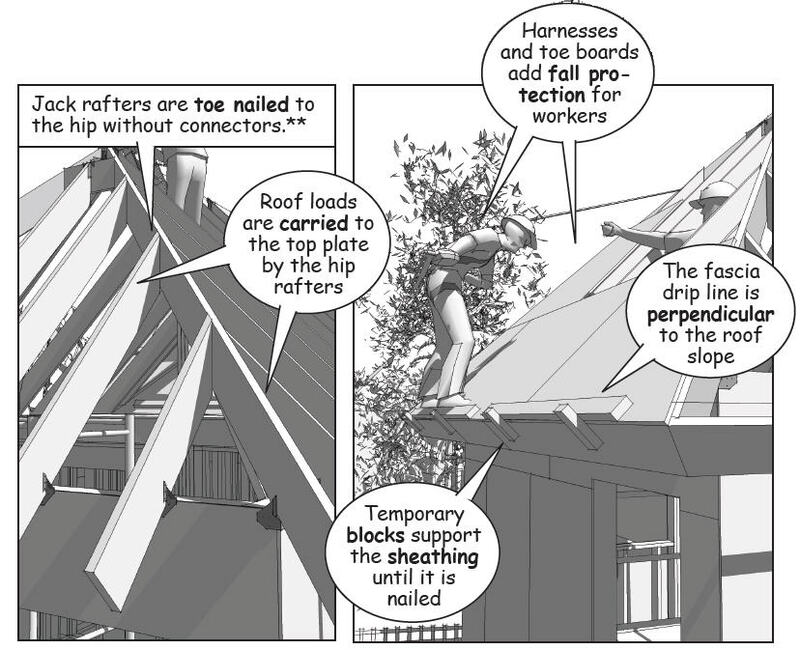 Note that fall protection is not always required for residential construction, but it is critical for safety regardless of the height of the roof and local codes.